Robby Hecht’s music represents a return to the early 70s golden era of acoustic pop where thoughtful, well-crafted lyrics were blended with timeless melodies to impact mainstream music and culture. His debut album Late Last Night, produced by Lex Price (Mindy Smith) and mixed by Roger Moutenot (Yo La Tengo, Josh Rouse), was released in May of 2008 and features an impressive list of guest performers including Mindy Smith, Jeff Coffin, Thad Cockrell, Jill Andrews (The Everybodyfields), John Deaderick (Patty Griffin), Andrea Zonn (James Taylor) and more. 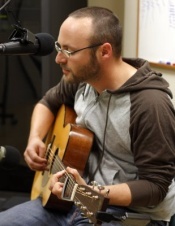 Raised in Knoxville, Tennessee, Robby first began writing and performing while attending The University of Wisconsin-Madison, developing and pairing his soulful voice and unique finger-style guitar. After spending time living in Paris and San Francisco, and a period fronting the band AllDay Radio, he eventually returned to his home state, settling in Nashville. A 2008 Kerrville New Folk Winner, Robby has played folk/roots festivals and venues across the country, sharing the stage with such legendary artists as Richie Havens, Greg Brown, and Patty Griffin, and garnering comparisons to early James Taylor, Paul Simon, and Amos Lee. Like these celebrated artists, Robby Hecht is a unique voice -- one that is stirring, instantly recognizable and truly original.